And that dog just so happens to have some of the softest fur on the planet. You already know where this is going, don’t you? 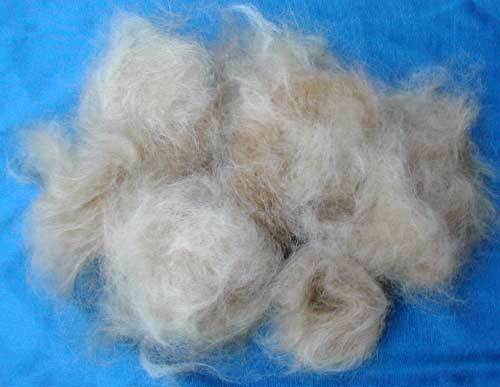 I’ve always cringed at discarding the fluffy, furry clouds I get from brushing Kate, our beloved Golden Retriever. For a while my husband was scattering it in the garden to ward off deer, but, truly, it didn’t work. Now he puts it in a little paper bag for me. Sweet, no? It’s the September issue of Crochet! magazine that’s got us squirreling away dog hair. Pages 16-18 have basic information about spinning yarn from dog hair and a pattern for a tam (oh, and some cute doggie pics!). While I won’t be making the hat, I was rather elated to see that, yes, you can spin dog hair. I’m thinking a scarf and possibly socks. 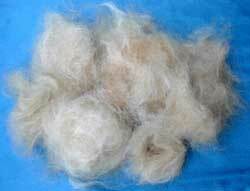 Had I bothered to look on the web before, I would have been saving dog hair a long time ago (see resources below). Kate likes the plan because she thinks it means she’ll get brushed more often. She’s probably right. Now I just need to learn to spin. Our little pile so far and our little sweetie. VIP Fibers: Hand Spun Yarn from your very important pet! Edit: Thanks to Jenn for bringing up the subject of odor. From what I’ve read, once the yarn is washed, odor is usually not a problem. Of course it does depend on the dog, as some are more oily and naturally more odorous than others. If Kate’s turns out to be, ahem, fragrant, I’ll be putting either Nature’s Miracle or Smells Begone in the final rinse. These are excellent products I’ve been using for years; I can’t say enough good things about them. NM is available in nearly all pet stores. SB is a bit harder to find, but is readily available online (google it). If you have something SB won’t get the odor out of, you’d better burn it, LOL. Awww, your Kate is adorable. 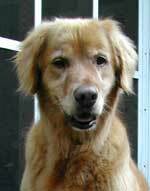 I used to be involved with Golden Retriever Rescue. A few years ago, a big group of us collected brushings (all from Goldens) and sent them to a woman who spun it. An afghan was made from the yarn and then raffled off as a fund raiser. I didn’t get the pleasure to see it in person but the winner said it was so incredibly soft and not stinky at all. Dog hair is wonderful to spin! I usually blend it with wool to give it some ‘memory’ – it is warm than wool too! Have fun! I should have thought to mention that, Jenn. :lol: From what I’ve read, once the yarn is washed, odor is usually not a problem. Of course it does depend on the dog, as some are more oily and naturally have more odor than others. Does the yarn you make from the dog hair smell like dog? Just the thought of wearing something that would smell like a wet dog when damp, makes my stomach do little flipflops. Kate is a cutey! I want to spin the hair from my cat Zoe. One of these days I’ll learn to spin myself. Oh, yes, Kate is adorable! I can just tell from the photo that she is so soft! Very interesting post! I can’t wait to see your crocheted doggie hair work! I’ve been saving up dog hair for the past couple months, and I’m just learning to spin. I think the fur from our Australian Shepherd is going to make a lovely yarn, but I don’t want to waste it until my spinning abilities improve. I’ve know a couple people who have tried this, and their end products (a throw and a sweater) didn’t smell ‘doggy’ at all.